(TibetanReview.net, Mar07’16) – To commemorate the 57th anniversary of the Tibetan National Uprising, over 200 people from more than 20 civic groups as well as lawmakers marched through downtown Taipei on Mar 5 to call on China to free Tibet and uphold human rights, reported taipeitimes.com Mar 16. The main events will take place on the uprising day of Mar 10. The report said members of the Welfare Society for Tibetans in Taiwan, Human Rights Network for Tibet and Taiwan, Taiwan Association for Human Rights and other groups gathered in front of Pacific Sogo’s Zhongxiao E Road department store for a rally before setting off on the march, with numerous speeches by legislators expressing solidarity with the Tibetan cause. The report said New Power Party (NPP) Legislator Freddy Lim called on President Ma Ying-jeou and president-elect Tsai Ing-wen to allow the Dalai Lama to visit Taiwan. The report also cited Democratic Progressive Party (DPP) Legislator Tsai Yi-yu as saying Tibet should serve as a “warning” of what might happen to Taiwan, calling on the Executive Yuan’s Mongolian and Tibetan Affairs Commission to be frozen to express solidarity with the Tibetan cause. DPP Legislator Kolas Yotaka — a Yami Aborigine elected on the party’s at-large legislative slate — has said that the Aborigines of Taiwan and Tibetans faced similar challenges. “We were both originally independent nations, but have been losing our political systems, social structures, religious beliefs and languages ever since colonizing powers came,” she was quoted as saying. 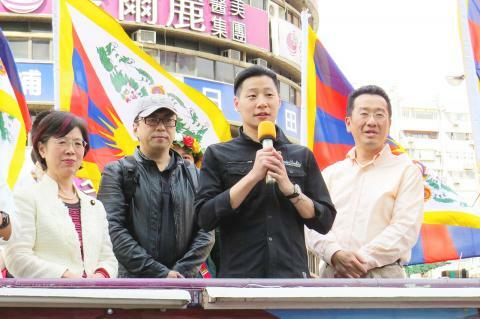 New Power Party Legislator Freddy Lim, second right, speaks in Taipei as three Democratic Progressive Party legislators look on at a rally to promote Tibetan rights. The group was reported to have sung the Tibetan national anthem while Tibetan monks prayed for a long life for the Dalai Lama before they marched away to chants of “Free Tibet” and “Long Live the Dalai Lama”. A large portrait of Tibet’s exiled spiritual leader, the Dalai Lama, led the procession, followed by more than a dozen Tibetans waving large Tibetan flags. The group was reported to have marched to the Kelti Building, which is often used to symbolize the Chinese government in the absence of a formal representative office, as it houses the offices of the Cross-Strait Economic and Cultural Interchange Association, the Bank of China and other Chinese associations and firms. The participants then held a “die-in,” sprawling on the road in front of the Kelti Building in solidarity with Tibetans who had self-immolated to protest Chinese rule of Tibet. The group has also marched to Taipei 101, saying they wanted to share their message with Chinese tourists. 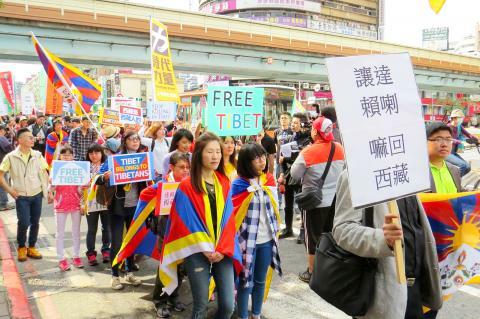 The report said further events to mark the national Tibetan Uprising Day were scheduled for Mar 10 night at the National Chiang Kai-shek Memorial Hall’s Freedom Square and Kaohsiung’s Human Rights Learning Study.